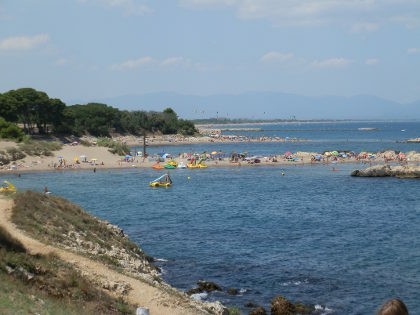 Between L'Escala and Sant Marti d'Empuries are a series of open sandy bays separated by small low rocky outcrops. The beaches have very soft sand and shelve gently into the bays with views across the Bay of Roses to Cap de Creus and Roses town itself. Behind the beaches are a series of dunes and cypressa woods with a few houses, the Hostal d'Empuries hotel and then large archeological site of the Ruins of Empuries. Parking is relatively easy (though paid for during summer) and there is a long wooden path than links the beaches and headlands along the coast. Though it lacks the dramatic cliffs and rocks of the more southern Costa Brava, the quality of the sand, the clear water and the linked bays, beaches and small islets put this in among the top beaches for the Costa Brava. In practice there are a series of four bays to choose from giving a lot of places to choose. 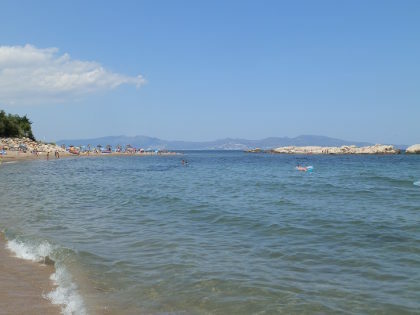 The beach closest to L'Escala is the least interesting looking, but the bays that start with the Hostal d'Empuries (the only commercial outlet until Sant Marti d'Empuries village), up to Sant Marti are all delightful linked by spits of sandy beach and rocks at each end. The most northerly beach also has the remains of the Greek port wall separating part of the beach from the sea. The area is popular, particularly with French visitors, but as there is only the one hotel nearby and the beach area in total is quite large even in July, the beach didn't feel over-crowded. The beach is in front of the ruins of Empuries (an abandoned Roman and Greek town now in ruins) with easy car access and parking in amongst the trees at the back. The only commercial establishment is the Hotel d'Empuries behind the second beach which also has food and a bar. The village of Sant Marti d'Empuries is also full of bars and restaurants. On the beach, umbrellas and loungers can be hired (the natural 'palm' type of umbrellas) and there are facilities for hiring longboards and pedalos. The dunes behind the beach are a protected area and add shelter from behind. Lifeguards monitor each area. The sand is some of the finest on the Costa Brava being smooth and fine both on the beaches and into the water - perfect for sand castles or playing beach sports (if there's enough space). Around the edges of each beach are rockier areas and, in one place islets that can be reached by wading out. The beaches are all gradual into the water, which with the smooth sand, makes them excellent for small children. Swimmers can swim across the bays and around the headlands allowing for long-distance swims. The bays are mainly sandy, but interspersed by some rockier areas and in the rockier areas there are fish which makes them good for snorkelling. The small islets also give something to swim to. The occasional rocks mean that some care is needed in shallower areas so as not to bump. The water was very clear, but the open nature of the bays means there's the possibility of flotsam accumulating at one end of a beach blown by the wind. Parking can by accessed by following the signs for Ruines d'Empuries. There are a number of paid-for municipal parking areas under the trees. Alternatively park closer to L'Escala and then take the very pleasant stroll up to the beaches.